Baby on the loose! 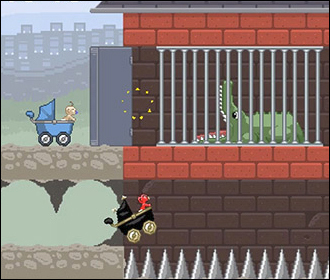 Protect the unsuspecting baby James from dangers at every turn: stun animals so he can ride on top of them, flip switches to activate ramps, detonate explosives, avoid spikes, and watch out for his nemesis evil baby! 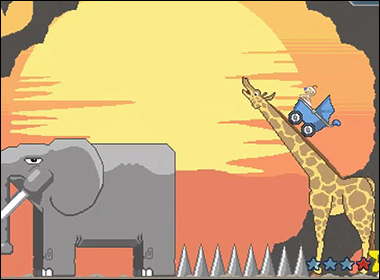 This page saves your progress, so choose "Load game" when you come back. Download the full app for free at iTunes and Google Play Store to access all the stages. Costumes: Collect stars hidden in stages to unlock all 24 costumes including a knight, zombie, and astronaut. The path you take through the stages can change depending on which costume James has equipped. Abilities: Earn red stars by completing stages without taking damage; use red stars to unlock abilities and explore previously inaccessible areas.